You will definitely love our fantastic quality body jewellery gifts which will update your style. Whether you’re looking for a secret santa gift or stocking filler, our amazing Christmas gifts for men and women will put a smile on your face. Sweeten your style with this fabulous buffalo etched heart flesh tunnel. This black tunnel with a red open heart design will give you a beautiful glossy finish every single time. 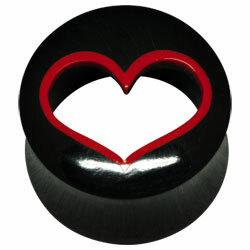 Everyone will fall in love with this eye-catching heart flesh tunnel which is available in a gauge size of 8mm to 16mm. 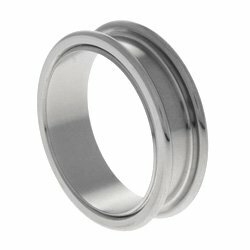 Our double flared jewellery will stay secure and will look great in both men and women’s piercing. 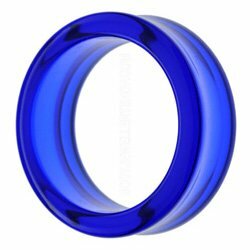 We do advise you to only wear this tunnel when your piercing has fully healed otherwise you will be at risk of damaging your stretch. Snap up this bargain body jewellery gift pack which will light up your look and add a splash of sparkle to your look. This ball closure ring with 5 coloured clip in accessories will look great with absolutely any outfit or piece of jewellery. You will love our shimmering black, pink, green, light blue and dark blue balls that will instantly enhance your appearance and impress all your friends. Your son or daughter will love receiving this incredible body jewellery bonus pack for Christmas and will enjoy wearing it to all their special occasions. This entry was posted in Ball Closure Rings, Balls and Accessories, Body Giftware, Ear Piercings, Gifts and Accessories, Stretched Piercings, Stretching Jewellery and tagged Ear Tunnels, Flesh Tunnel, Flesh Tunnels, jewellery bonus pack, Stretching Tunnels on November 29, 2011 by Piercing Guru.